SCVHistory.com | St. Francis Dam Disaster | Survivor's Guilt: PTSD Wrecks Lives the Floodwaters Spared. Survivor's Guilt: PTSD Wrecks Lives the Floodwaters Spared. For Joe Gottardi, the St. Francis Dam Disaster Wasn't Something You Get Over. By Dianne Erskine-Hellrigel | February 6, 2018. 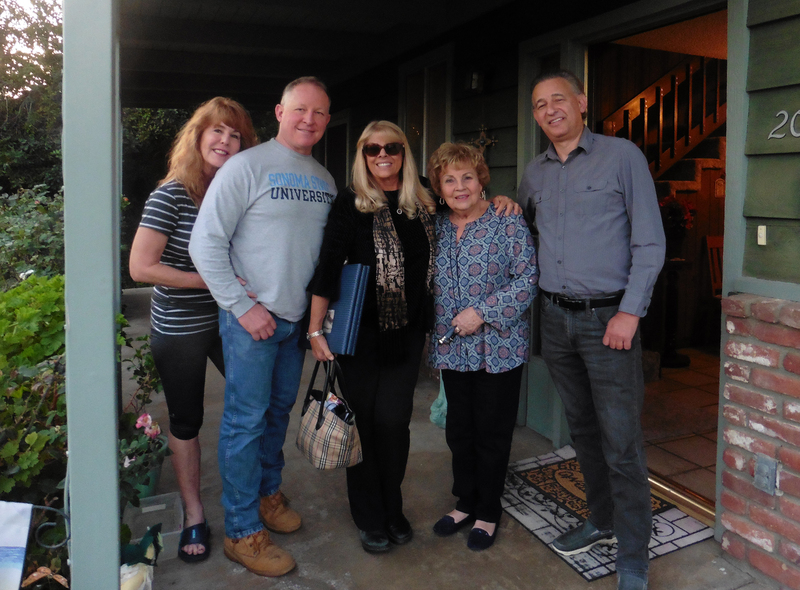 Jan. 17, 2018, Frances Clausen's home in Camarillo (From Left): Kathleen "Kandi" Ann Miranda, Fran's daughter-in-law; Frank A. Miranda Jr., Fran's son; Dianne Erskine-Hellrigel (the writer); Frances Guadagno Clausen (daughter of Alvina Gottardi Guadagno); Dr. Alan Pollack, SCV Historical Society president. Photo: Eva Gritz/SCVTV. Click to enlarge. Joe Gottardi woke in the early hours of March 13, 1928, from the noise at Kemp Camp and the oncoming floodwaters and debris. He looked toward Blue Cut from his house and realized the flood was about to hit. He awakened his family and told them they didn't have time to escape. He asked them to hold hands and kneel down to pray. They were devout Catholics; they regularly attended St. Sebastian Church in Piru. The water was upon them quickly. It uprooted their home on the property they leased from The Newhall Land and Farming Company. The family was inundated with water and debris. Five of the children and Joe's wife, Frances, perished. Only Joe and his eldest daughter, Alvina, survived. Joe had trouble dealing with the loss of his family, especially in the immediate aftermath of the flood. He had survivor's guilt and placed the blame on his surviving daughter — for saving his life. Alvina was left alone while Joe dug for his family members' bodies. Joe had come to the United States in 1906. 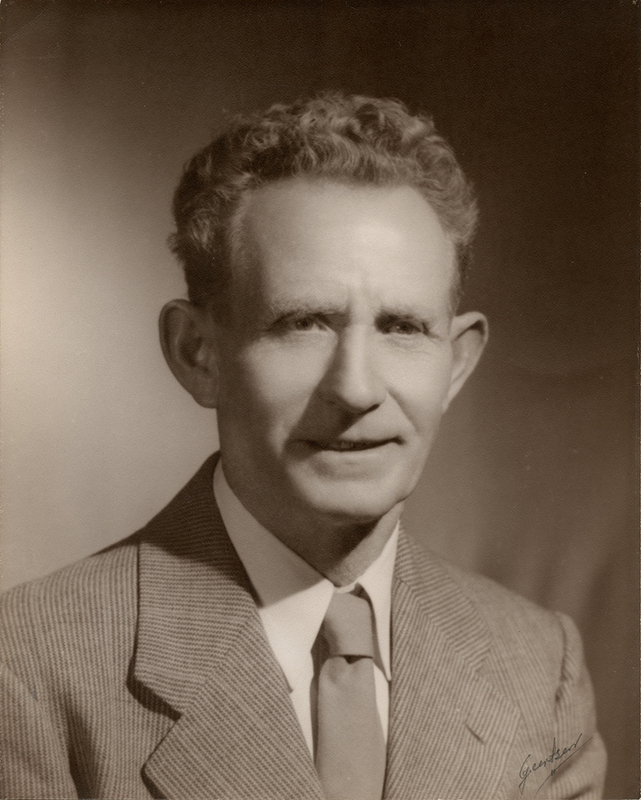 He was born in Venice, Italy, on May 30, 1886. His wife, Frances, was born in Texas on March 13, 1890. Her mother, Ramona, was born in Mexico. Alvina Gottardi (Guadagno), about the time of the flood. Click for more. Alvina was born Dec. 5, 1912, in Piru. Fran Clausen, her daughter, describes her mother as overprotective, vulnerable, intense, well loved, very loving, organized, clean, in control; and on the surface, she had it all together. Alvina liked to be in control so nothing bad would happen. But Alvina was deathly afraid of water. She would bathe her children in only a few inches of water and rinse them off with only a cup she poured over them. She hated rivers, lakes and the ocean. According to Fran, on the night of the flood, Alvina had a dream that predicted it. In the dream, a nun came to her as an angel. She was told the flood was coming, and that she was to grab onto a branch ... grab onto a branch ... so, when the flood hit, Alvina quickly looked for a branch. She saw a log and grabbed onto it. Then she saw her father struggling in the water and debris. He was wearing a night shirt. Alvina maneuvered the log over to him. The log grabbed onto his shirt, and he and Alvina were swept downriver, landing in Santa Paula, on the south bank. Alvina saved his life. But Joe was angry that he couldn't save any other members of his family — and if they had to die, he felt he should have died with him. He blamed Alvina for this. He was resentful for the rest of his days. Alvina was traumatized by her father's reaction. Family members said Joe had ranch hands who lived on the ranch, and all of them were lost, as well, when the flood came. Later in life, Alvina sought counseling, and it brought her some peace before she died. She didn't like to talk about the flood. She avoided the conversation whenever possible. She spoke about it more to her granddaughter than to her own children. She didn't open up until much later in life. When she sought grief counseling from Dr. Emily, the doctor told her it wasn't God's will, and Alvina hadn't done anything wrong. She saw Dr. Emily from 1984-1985. Alvina told her that during the flood, "I begged him (God) not to take my family." But he didn't hear her prayer. After the flood, Joe and Alvina moved to Santa Paula. With the $25,000 settlement Joe received from the city of Los Angeles, he bought two orange orchards in Santa Paula and continued his practice of farming in Heritage Valley. Joe Gottardi, post-disaster. Click for more. Alvina married Victor Guadagno in January 1934. Their daughter, Frances Guadagno (Clausen), came along in 1937, just shy of 10 years after the St. Francis Dam Disaster. Victor owned a market and a pool hall. They didn't blame the L.A. Department of Water and Power or its chief engineer, William Mulholland, for the disaster. It was just something that happened. Alvina's favorite thing to do was to cook and bake. She was very prim and proper. She adored her family. She loved to entertain. She was a perfectionist and meticulous, perhaps to the point of obsession. She was also active in church. She prepared the church's floral arrangements and pressed the linens. Losing her mother in the flood was the most devastating thing. She named her daughter after her mother, Frances. Alvina spent a lot of time at the cemetery; every holiday, she would bring flowers and clean the graves. She didn't want to abandon them. 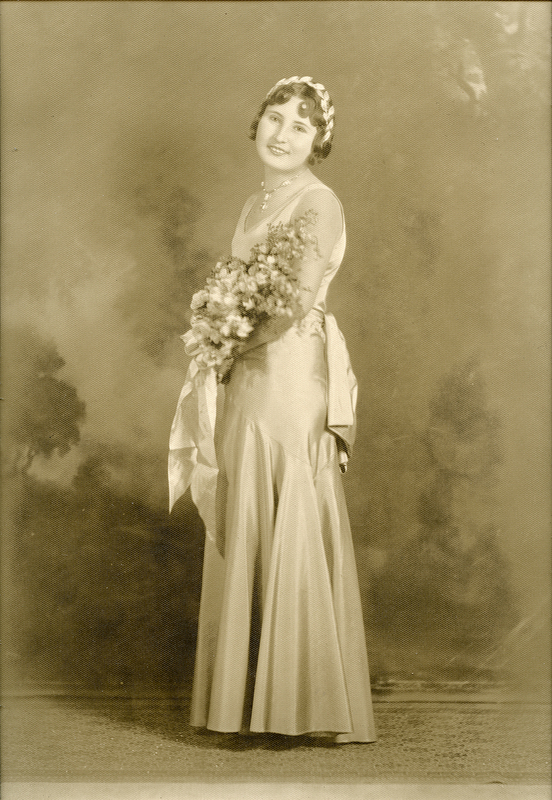 Alvina worked at Desmond's department store, Sears, and the Santa Paula Chronicle. Alvina's husband worked for Joe. Joe remarried an alcoholic and buried his sorrows in alcohol for a while. After the death of his second wife, he came back to his family and repaired their relationship. Alvina eventually moved into a rest home in Ventura called Brighton Gardens where her daughter remembers she was very happy. She was 92 years old when she died there in 2003. She is buried at Ivy Lawn Memorial Park in Ventura. Story based largely on interview conducted with Frances Clausen at her home on January 17, 2018.